What a fun book! I really didn’t expect it to be so entertaining. And Hetty is a rather surprising woman in some ways. As I read I think I know her and then she does the most surprising things – like make a friends with folks so different from herself and going to Europe on her honeymoon. Other times she’s just exactly what I expected – greedy and conniving. And although she lived very modestly, loved her children, was loyal to her husband and was good to her neighbors. She even stood up for the working poor. This is the stuff you don’t usually hear about her. 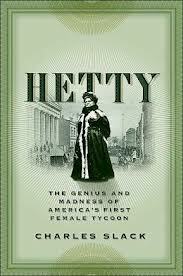 An important thing to remember about Hetty Green is that she was miserly about spending money on her own self and anything she deemed unnecessary. She feared (to the point of paranoia in some instances) that people were after whatever she had and she looked only to protecting herself and avenging any wrong she thought had occurred. She used her Quaker background when it was helpful (plain clothes, hard work and thrift). Otoh, she was incredibly disciplined about investing – she bought low, sold high, didn’t panicked and never went in for the speculation fevers. She loaned money when the borrower met her standards and got revenge on those who cheated her or whom she perceived as ready to cheat her. She took numerous people to court including Collis Huntington and the trustee of her own money from her father’s estate. In the end, her principal crime seems to have been that the rules she chose to live by were her own rather than society’s. Hetty probably used her “miser” reputation to her own advantage – to a point she almost enjoyed it. Unbeknownst to the media, she donated to worthy causes anonymously, and loaned money at cut-rate to churches. I do wish Slack’s book had a little more psychological attention even as only a guess – or as appropriate gleanings from good sources. I’m really curious – there are lots of variables. It might be easy to discount this book as being “fluff” but Slack has his resource section lined up with a chatty type notes section, a bibliography and an index.